Thank you for listening to episode 76 of the podcast. 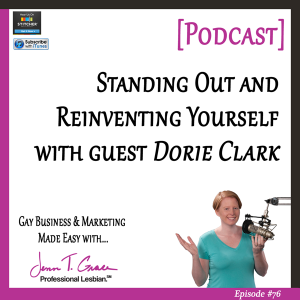 In this episode I had the privilege of speaking to Dorie Clark, a true triple threat! She’s a marketing consultant, author and keynote speaker. We were able to cover a variety of topics during our time together; ranging from the evolution of social media and the press to her groundbreaking LGBT work during her first college semester – at just age 14 no less! – to ‘covering’ in the workplace. I know you’ll find each of them as fascinating as I did. Dorie also shared the best advice she’s gotten and what keeps her motivated. Have a listen and let me know your thoughts below! Jenn T Grace: The first question that I want to ask you, is really to just tell my audience a little bit about yourself. So who is Dorie Clark, and what your story is, and basically what led you to where you are today in your career? Dorie Clark: Yeah, thank you. So today I spend my time doing a mix of different things. I am a marketing strategy consultant; I’ve worked with clients like Google and Yale University and the National Parks Service. I also write business books including ‘Reinventing You’ and ‘Stand Out.’ And I teach for the Fuqua School of Business at Duke, and spend a lot of time giving talks at conferences and for associations. But the way that I got to that is a little bit circuitous; and this is something that I actually talk about in my first book, ‘Reinventing You.’ I started my career as a political journalist and unfortunately got laid off very rapidly into my career. I switched over into working in politics, and so I was the spokesperson on a gubernatorial campaign, and then on a presidential campaign, ran a nonprofit for a couple of years, and then finally as a result of all of those things, I realized that running the nonprofit was essentially the same thing as running a business. And so I decided in 2006 to launch my own, and that is how I sort of sprung into the entrepreneurial ventures that I’m doing now. Jenn T Grace: Nice. So you’re coming up on your ten year anniversary, how exciting! Dorie Clark: Yeah, exactly it is pretty great. And finally I found a career that stuck. I love being an entrepreneur and working for myself, I find it really satisfying in that it suits my personality. Jenn T Grace: I’m sure, and I would imagine that over the last ten years- especially since your book is called ‘Reinventing You,’ I’m sure you’ve kind of reinvented the way your business has looked over those last ten years. Do you want to share anything about that? Dorie Clark: Yeah I really- you’d think that starting your own business would be a fairly consistent thing, you just decide what you’re going to offer and go do it. But I actually have reinvented my business many times within the umbrella of doing strategic communications. I actually started out essentially doing public relations; that was what I knew, I had been a journalist, I had essentially done PR for political candidates. But around the time that I was launching in 2006, I realized that- that was when social media was just beginning to take off, and people didn’t understand it, but they were sort of confused by it. That created a lot of opportunities, but what was happening at the same time is that the newspaper industry was continuing to collapse. And so clients were expecting the same things out of PR as they always had, which is they are having a press conference, you need to have the Regional Daily there, and they need to get really good placement in the paper. And it became this incredibly painful and arduous task to explain to them, ‘No the reason the reporter isn’t there to cover your press conference isn’t because your PR consultant has done a crappy job, it’s because reporters don’t exist anymore because they’ve all been fired, and the newspaper’s size has been cut in half, so you’re not going to get in the paper for a conference announcing that you’ve given $500 to the local charity.’ So it became just such a terrible, thankless task. I realized alright, I’ve got to get out of PR. And so I shifted into marketing strategy, that was the first innovation. I also originally thought I’d be doing a lot of work in politics, but began pretty quickly shifting into doing corporate and nonprofit work. And so again and again there were these reinventions. And then finally in about 2009 or 2010 I shifted in a big way and decided that I needed to try to play a bigger game, and instead of being a local or a regional consultant in New England, which is what I had been doing, I decided that I needed to make a real investment in terms of building my so-called platform, and getting better known. And so I committed myself to doing a lot of writing, and blogging, and speaking, and getting myself out there so that I could hopefully raise my profile to be a national or international consultant instead. Jenn T Grace: That is awesome. So in terms of your blogging, and just the content creation you’ve done. I’m on your mailing list, so I get your information, but who would you say is the ideal target market for you? Like who’s your ideal reader of your newsletters, or who’s reading the blogging content that you’re putting out there, or someone who’s reading your book? Because I’ve looked into both of your books, I actually have not bought them yet, I have about four on my audio account that I have not gotten through yet, so I want to make sure I had time to digest them. But I would love to know just a little bit more about your books, and who the ideal listener or reader is for those. Dorie Clark: Well for my first book, ‘Reinventing You,’ it’s really a book intended for people who want to make a change in their lives. And it could be that they want to change jobs, it could be that they want to change careers, it could be that they want to change how others perceive them. But it is a book about how to manage that change, and take control of it so that people are seeing you the way that you would wish to be seen; that’s the general premise there. For ‘Stand Out,’ my most recent book, that’s a book that’s aimed at folks who are happy in the place that they’re in, they love their job, they love their career or their field, but they want to try to break through to the next level. And it’s a book to really help them become a recognized expert inside their company, or inside their field. If you’re an entrepreneur, if you know that your career could benefit by raising your profile and getting your ideas out there more, that is a book that really tried to provide a roadmap for that. Jenn T Grace: Nice. And when you were creating both of these books, did you have any type of ‘ah-ha’ moment around them, or I guess around what you were doing? I know that you gave a little bit of a background how you got to the point of starting your business, but was there any real kind of kick in the pants that was the thing that made you say, “I have to write this book”? Dorie Clark: Well you know in many ways for my first book, ‘Reinventing You,’ I had been- I think the biggest ‘ah-ha’ moment is that sometimes you can be trying something forever, and just be hitting walls, but when you have the right idea, all of a sudden you discover that the walls have a door, and that the door just swings open. And it’s such a marked difference, it was really dramatic for me. So in 2009 I decided that that was going to be my year, that was going to be the year that I sold a book. And so I spent the first half of the year writing three different book proposals, because I was convinced that I just need to come up with the right idea, and then some publisher would take it. But it turned out that was not at all how it worked. All of them got turned down because I kept hearing essentially that I was not famous enough, and so they did not want to take a chance on working with me. And that was enormously frustrating, and it meant that I kind of had to go back to square one. So I started blogging, that was what prompted me to do it, and finally about eighteen months later, toward the end of 2010, that was when I started blogging for the Harvard Business Review. And the second post that I ever did for it was called, ‘How to Reinvent Your Personal Brand.’ And when that post came out, it was successful, and they asked me if I would be willing to take it and turn it into an expanded version for the Harvard Business Review Magazine. And so I did that, and within a week of it hitting newsstands of February of 2011, I had three different literary agents approach me and ask if I was represented, and if I was interested in possibly creating a book proposal. And so I said, “Oh wow, is this what it’s like to be wanted? Because all of my previous efforts had kind of come to not.” And all of a sudden, folks were coming to me. And so I quickly put together a book proposal, was able to sell it to Harvard Business Review Press, and it resulted two years later in ‘Reinventing You.’ So I think the biggest ‘ah-ha’ was just that when the idea is right, and when you do in fact have a platform established, then things are just enormously easier than what you might have experienced previously where a lot of the doors are shut. Jenn T Grace: Yeah and you know one of the things that I think that you touched on that’s so incredibly important for people listening to understand, is that it took you eighteen months of just blogging. And I’m sure that- did you have some sort of consistency or routine where you did it once a week, twice a week, once a month, that you did over the course of those eighteen months to kind of build your base of content? Dorie Clark: Later I developed a routine, and began blogging incredibly regularly. But during the eighteen months- actually most of them were spent attempting to break in various places. I knew that what was going to be important for me was so-called social proof; IE getting some more powerful or established brands associated with me. And so I spent an inordinate amount of time and energy trying to connect and break in at certain publications, and hitting a lot of walls, a lot of rejection from editors. Frankly it was very insulting because I had been a professional journalist, I had been paid to write just a few years previous, and now I was basically raising my hand saying, “Hey I’ll write for you for free,” and they don’t even bother to get back to you. But that’s the reality for a lot of these things, and you just have to keep persisting with it. But so it was mostly slogging through that in order to get the connections and relationships teed up. So first I was able to break in at the Huffington Post, and then finally at the Harvard Business Review. But later on starting in early 2012 I decided that I wanted to find a venue where I could write much more frequently. And so I wrote for Forbes for three and a half years, and I did it a minimum of five times a month, but oftentimes as much as ten times a month, so I was really creating a very steady flow of content for them. Jenn T Grace: Wow, that is intense. That’s amazing though because it just goes to show that hard work and persistence really are those keys to success. Because I’m sure when you kind of came out on the scene and all of a sudden you have this book, people might just think that it’s an overnight thing, and everybody thinks that success happens overnight. But really you had been putting in a significant amount of work for a really long time prior to that to really be able to leverage that type of success. Jenn T Grace: Wow, that’s awesome. So what keeps you motivated on a day-to-day basis? I know that we’re connecting right now between two kind of big stints of travel for you. Is there something that just is your guiding principle that keeps you on track and motivated to keep on doing what you’re doing? Dorie Clark: Well one thing that I try to do is each year- actually I guess technically it’s maybe every six months, I try to set three top priorities for myself that are going to be the kind of north star for that period of time. I think that if you have more than that it becomes really difficult. So for the first half of the year for instance, my big goals were launching my book successfully, ‘Stand Out,’ which came out in April. Doubling the size of my email list which I figured would be something that took the whole year. Fortunately I was actually able to do it much sooner than that, so that was encouraging. And then finding a girlfriend. So those were my priorities for the first half of the year, and now moving into the latter half of the year I’m sort of shifting over. So the book is launched, so then what kind of replaced that slot was that I wanted to sell the proposal for my next book. And so I actually have just agreed to a contract for my third book, which I guess will probably be coming out in 2017 or 2018. But I think it’s important to make sure that you’re always having something to look forward to, and always moving the ball forward. Jenn T Grace: Yeah, absolutely. Goal setting is so incredibly important. I’m glad that that’s part of your routine as well, and it makes sense that since you’ve seen such enormous success so far. So in terms of I guess just saying your book would be 2017 or 2018, I’m always so- not shocked because this is so kind of the norm, that it takes such a long period of time to go from concept to actual execution when you’re going through a traditional publishing route. Is that frustrating to you at any period of time? Like do you ever think like, ‘Oh I wish I could have this in six months rather than two and a half or three years’? Dorie Clark: Oh for sure with my first two books it was really frustrating because I wanted to get it out there. I knew that a book would be a key driver in terms of building my brand, and that it would accelerate my success. And so it really couldn’t happen fast enough for me. I was enormously frustrated that it took just about two years from signing the contract to the book coming out for ‘Reinventing You,’ and then it took about eighteen months between signing the contract and ‘Stand Out’ coming out. That felt so interminably slow to me. But actually for this third book I actually feel okay about it because I’ve been on a little bit of a treadmill for the past four years writing books, promoting books, et cetera. And so I’m actually looking forward to having a little bit more time hopefully to work on this, and to write it so that I can focus on other elements of my business beyond literally just either writing or promoting books. Jenn T Grace: Interesting. And I know that you had talked about marketing strategy in the beginning and that’s something that you focus on. How much of your I guess time maybe now versus how you want it to be are you focusing on helping other companies be better, versus promoting or writing your books? Dorie Clark: So before I started writing my books, which really was the driver for expanding other facets of my business, probably 95% of my income was based on consulting; I just had a traditional consulting practice. I deliberately over the past few years have tried to shift it so that now it’s actually much more equal, it’s much more I would say in maybe fifths, and I wanted to do that deliberately as kind of a market hedge. So I probably get about 20% a piece of my income from consulting, speaking, coaching, writing the books, and then doing executive coaching. Jenn T Grace: Nice, that’s awesome. And it’s always good, they always say it’s good to diversify your income in your investments, but it’s also true for your business. It just makes you more sustainable. Jenn T Grace: Very cool. So in terms of- I want to switch over into LGBT stuff momentarily, but I do want to ask you what is the best piece of advice that you’ve been given, whether it’s from a mentor, from a book, from pretty much anywhere that’s just one of those things that has either helped you personally or in your business? Dorie Clark: Well you know I think that- I’ll go way back, something that was really impactful to me not even when I was starting my business, but just when I was a kid, was when I was thirteen I got handed a copy of Tony Robbins’ book ‘Unlimited Power’ by a friend’s mom. And I had seen it out on their living room table or something and I asked her about it and she said, “Oh my God, you need to read this.” She said, “If you read this now, this will totally change your life.” And so I read it when I was thirteen, and it was great, I thought it was really fantastic because it was the first book that I had ever read- essentially the first self-help book I had ever read, but it was the first book that I had ever read that really made the point- which I wish more people would kind of clue their kids into, that you can choose your reactions to things. That you really have a lot more power and control over your life, and over how you react to things, and the decisions that you make than you might have been led to believe. And I found it really helpful, and really empowering, and I think that it’s been useful to me as I’ve gone through and done everything entrepreneurial or otherwise. Jenn T Grace: That’s interesting. I’ve been looking up and reading more things on emotional intelligence lately, it seems to be kind of a hot topic going around. And I think that that book probably falls in line with that train of thought pretty well. Dorie Clark: Yeah, for sure. Jenn T Grace: Interesting. Okay so I appreciate your time thus far, this has been awesome and I know that you’re just a well-known business figure which is fantastic, and I wanted to make sure that everybody had a good sense of who you are and where you’re coming from as far as the business side goes. 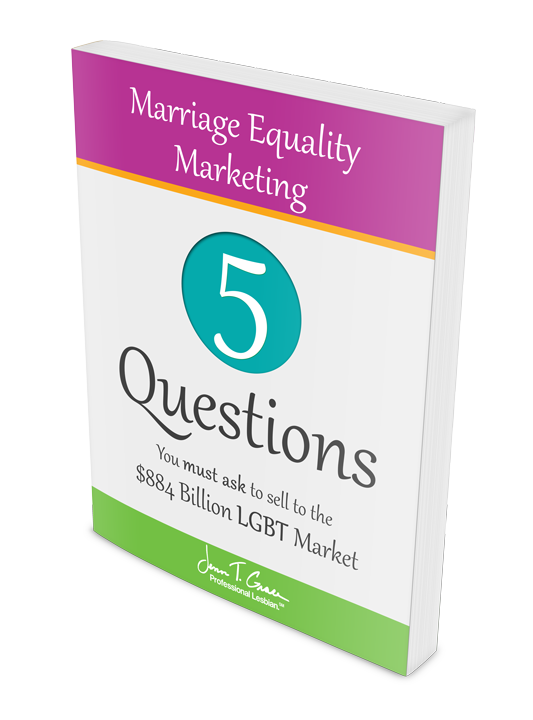 I do want to talk to you a little bit more around marketing, and specifically around the LGBT community. And you’ve already alluded to the guests listening that one of your goals was to find a girlfriend, which I love. So in terms of just talking about LGBT, first I want to ask you if you would be willing to share a coming out story with the listeners. Whether it’s from something that had to do with family, friends, in the workplace; is there any particular one that just kind of sticks in your mind when somebody asks you about a coming out story? Dorie Clark: Sure, yeah absolutely. I would say that one thing that when I think back on coming out, I did it pretty early. I was about thirteen when I realized that I was gay, and then I started telling everybody when I was fourteen. But part of what made that possible, because I was growing up in a really small town in North Carolina where this was not really talked about a lot at the time, and in fact I didn’t know any other gay people, had not met any other gay people for about a year after I came out. So I was the only gay person I knew for like a year. So that took a while. But one of the things that I did, which I am really glad that I did, and I’m really glad that my parents let me, was I had this feeling that I would be a lot better off leaving my town, and so I went to college early. There’s a program at Mary Baldwin College in Virginia, and so I entered there when I was fourteen, and that was actually really great because even though Mary Baldwin was a relatively conservative campus, even a conservative college is usually better than a small high school in North Carolina, at least at the time. And so I was able to find a community of likeminded people, and so along with my first girlfriend, and our friends and whatever, we actually founded the first LGBT- there was not ‘T’ then.  But the first LGB organization at Mary Baldwin. And so that was fall semester of my freshman year. And we went through the whole process, it was kind of controversial on campus. ‘What is this gay propaganda group?’ But we passed it through and we got it organized, so I was really proud to be able to be a part of getting that dialogue started on campus. Jenn T Grace: That is so amazing and so impressive that as a young fourteen year old, you certainly went in with a bang. Dorie Clark: Thank you. Well I think part of it was probably because I was fourteen. Because I was hugely opinionated and hugely convinced of the righteousness of all of my beliefs. Jenn T Grace: Well that’s awesome. But you know what? It’s that type of mindset that affects change, and that’s what you did which is totally awesome. Have you gone back to that college since you graduated? Or maybe just in colleges generally because I know that you’re out there speaking. But do you ever speak on the topic of LGBT or is it really just specifically business focused? Dorie Clark: You know I’ve never been asked specifically to speak on LGBT issues. Although I do try to bring it into my talks where it’s relevant. For instance there was a conference that I spoke at about a year ago in Providence called BIF: The Business Innovation Factory. And it’s a pretty cool annual conference. And their shtick is that they ask speakers to give a talk that they’ve never given before, and a really personal talk; that’s what they were after. So they don’t just want your standard thing, your standard business talk, they want something really personal about you. And so I gave a talk to them, and really shared my own experiences. And the hook of it was I talked about research that Deloitte and NYU teamed up on about the phenomenon of covering. And so I spoke about that and my own experiences. And it was great, it was really well received. I think some people said it was like the first kind of gay themed talk that they had had at that conference which had been going on for a number of years. And so that was pretty cool. And in fact if folks are interested in checking it out, on my website which is www.DorieClark.com, I have a videos page, and it’s up there. It’s been my talk for BIF. But also I’ll just mention that I have a free resource, it’s a free 42 page standout self-assessment guide, and people can download it for free from www.DorieClark.com and when they sign up for it, if they wish to get such a thing, they will get a series of weekly emails with just like all my best articles, and videos, and things like that. And one of the things that they get sent really early on is a link to the BIF video if people are interested in checking that out. Jenn T Grace: That’s awesome. So while you were talking I was thinking how- my question in my mind was going to be, “I wonder how up front you put this particular video?” Because it’s so personal, and it’s so not part of your normal business presentations. But I think it’s amazing that you actually included right early on. And imagining that’s so people get to know the real Dorie Clark versus maybe what their perceptions are. Would that be accurate? Dorie Clark: Sure, yeah absolutely. I mean- and also I feel like- I look pretty gay. And so I think it would be silly and disingenuous for me to not talk about it, or address it, or whatever. It would just be like this sad meta example of covering, and I feel like one of the things that I talk about a lot is the importance- I mean like now everybody’s talking about it to the point where the phrase has become nauseating, but talk about authenticity. But I really do think that it is genuinely important to be yourself. And of course that means that some people are not going to be into it, that some people are not going to enjoy your message, but you know they’re not going to enjoy my message anyway because I’m a girl in men’s suits. So too bad. So for the people who do enjoy my message, I think that it is important to just be up front, and if there’s good interesting material that I think can be helpful to people, I want to put that out there. So yeah, I make it fairly prominent. Jenn T Grace: I think that’s great, and so for people who are listening and may not know the term ‘covering,’ I’m very familiar with the Deloitte study, so I’m familiar with it. Could you A) just give a quick synopsis of what covering is, and then the additional question on that would be is there an example that you can think of where you yourself have been put in the position of having to cover? And how has that felt? Dorie Clark: Yeah so when it comes to covering, I- so the basic idea, this is a term originally created by Erving Goffman who was a famous sociologist mid-century, and it was later taken up and expanded by Kenji Yoshino who’s a professor at NYU. And he teamed up with Deloitte, in particular my friend and colleague Christie Smith, to expand it and to do a pretty detailed study about covering in the workplace. And the idea is that covering is- you could call it maybe a more subtle form of discrimination or oppression. The sort of discrimination 2.0 as it were. Because for instance if you’re talking about LGBT issues, obviously if someone feels that they have to be closeted, that’s an extreme example of people feeling really uncomfortable at work. But if we dial it down just a notch, there are circumstances where people might be out technically, but because they are nervous that it might not fit in, or it might make people feel uncomfortable, or it’s just not the kind of place where they feel really okay being themselves. Even though technically people might know they’re gay, they’re behaving in ways that minimizes that identity. And so it could be that everybody else has pictures of their families on their desk, but you don’t have a picture of your partner up. Or it could be that you are just a little bit careful about talking about what you’re doing that weekend because you don’t want to constantly be bringing up your girlfriend, or whatever. And so that’s the LGBT example, but there’s also examples for ethnic minorities that maybe they feel uncomfortable hanging out with other members of their cultural background because it might look like, “Oh well why are all the black people hanging out?” Or there’s examples even of straight white men; people might think, ‘Oh well they don’t need to cover.’ But it turns out that 45% of straight white men actually report covering in some fashion. Maybe because they have a mental health issue that they’re dealing with. I had a guy after my BIF speech come up to me and say, “What you talked about with covering, that was me.” He said, “I’m a straight white guy, and I got divorced, and for a while I was a single dad, and I didn’t want to tell people that because I was worried that they thought I wouldn’t be committed at work. And so we all have these examples, and it turns out unfortunately it’s fairly pervasive in the workforce, and it also turns out that it hinders people’s performance at work because they are having to manage their identity more than just being able to relax and concentrate on work. So eliminating the need to cover, creating an environment where people feel safe and comfortable being themselves, is one of the best things that companies can do for workplace productivity. Jenn T Grace: Absolutely. So now that you’re not in a corporate setting, or I guess it doesn’t even have to be a corporate setting, but you’re on your own, you decide what you do and when you do it. So have you yourself have experienced covering I guess even in your entrepreneurial adventures? 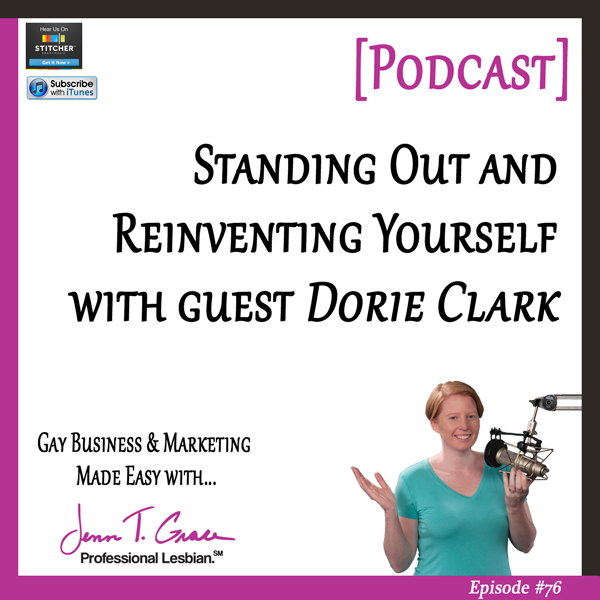 Dorie Clark: So I try to just be myself, put it out there in a nice way, and if people are not interested in doing business with me, then I just move onto something else. Jenn T Grace: I am on the exact same wavelength as far as that goes, I think that’s perfect. So in terms of somebody who might be listening to this- so say for example, because my audience is a good healthy mix of LGBT people, and then also allies who are just learning to know more about the LGBT community. For somebody who might be listening to this who maybe hasn’t made that step yet to be an entrepreneur, and maybe they’re in a workplace where it’s not necessarily conducive, do you have maybe some just any piece of hope, or some kind of piece of wisdom that you would say to that person if they are finding themselves in situations like this? Dorie Clark: Yeah, so I think that ultimately if you are in a situation where you are being implicitly or explicitly asked to sort of sand down your differences, to modify your behaviors to make other people feel more comfortable, it’s something that can be really damaging over time, and I think that ultimately of course it’s best to get out of that situation. But in the interim you may not have that option. These things take time. In my first book, ‘Reinventing You,’ I interviewed a woman who was able to reinvent her career, and ultimately it was this fantastic story. She went from being a hairdresser to a professional speaker on leadership topics. So it was so interesting. But she said that it was over a ten year period that she did this, because she had a ten year lease on her hair salon, and she just decided that over that ten years she was going to use that time to build up her reputation and her client base for her speaking business, so that when the lease was up she could make a safe and easy transition. And she said it’s like if you’re getting divorced, you don’t just yell, “Alright we’re through,” and then walk out the door. You want to try to plan it, you want to try to be strategic about how exactly you’re going to do it. And for any transition, whether it’s a professional reinvention, or finding a workplace situation that is going to be more amenable for you, sometimes it really does take time because you may need the money, you may have a family that depends on you. But it’s just kind of making strategic decisions now, and knowing that even if in the moment you are having to make sacrifices that are a little bit uncomfortable, A) it’s good always to try to not make assumptions, because sometimes we may guess incorrectly about what the climate is. Now I mean you may not, but it’s also possible that sometimes we might suspect that a certain person, or a certain thing would be frowned on, and actually it’s just us that’s paranoid. And it might actually not be received poorly. So getting a reality check from a trusted colleague is one important thing to do. But if it turns out you are in a situation where you temporarily have to be putting up with it, I think it’s really important to just separate ourselves and to realize this isn’t forever, and that over time you can begin to reposition yourself so that you’re working with people and with organizations that will be better and more accepting. Jenn T Grace: I like that answer, that’s really good. It’s reassuring but it also is realistic that it takes time to make any type of transition a successful one. Dorie Clark: Absolutely, and I think something- the drum that I try to beat in ‘Reinventing You’ and ‘Stand Out’ as well, is that one of the best investments you can make in your career is investing in developing a strong personal brand. Getting recognized both inside and outside of your company. Writing blogs, giving speeches, being involved in professional associations; all those sorts of stuff. Because if you do that, that is the best form of career insurance, and the more you make yourself invaluable to your company, the more you’re a rainmaker, the more you’re publicly recognized. 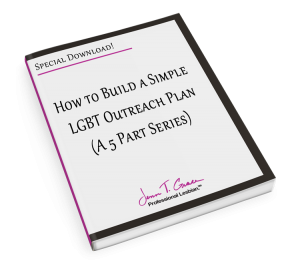 Frankly, the more leverage you have, and they will feel like they can’t afford to lose you, and even if they’re not the coolest in the world about LGBT issues, well if you’re valuable enough, they will deal because they have to deal. 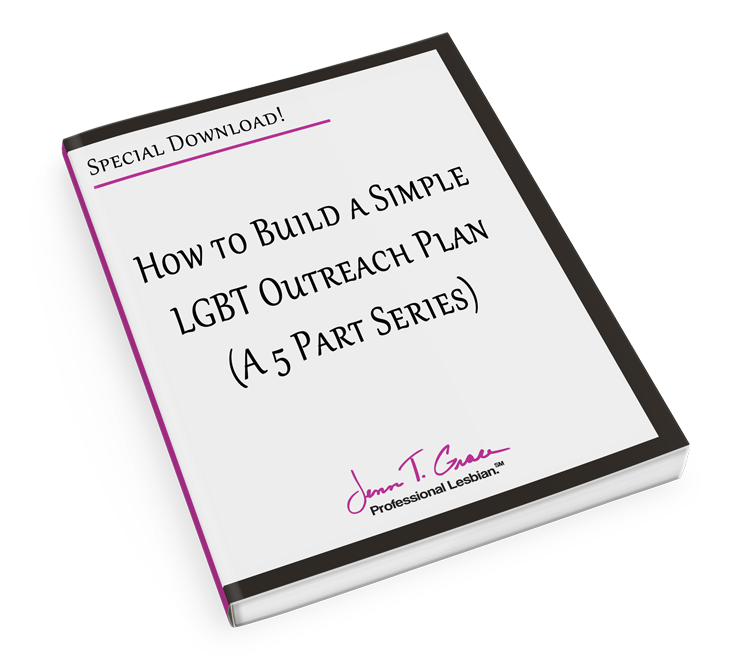 Jenn T Grace: And they’ll at the very least have to deal, but then that also kind of opens the door for potential opportunities like your young fourteen year old self to be able to make some kind of significant change within that organization around LGBT, which is really amazing too. Jenn T Grace: This has been fantastic so far. I want to ask you about marketing specifically. Not to suggest that you are an LGBT marketing expert, but rather partially from your background in marketing, but also just from a consumer standpoint. 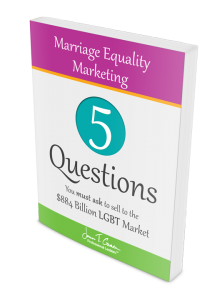 Have you- and I guess so those listening are looking for marketing tips or advice of how they can better position themselves to market to the LGBT community. So in that vein do you have any particular kind of thought, or a piece of advice, or just kind of anything that you think that you could share that might help make them slightly more successful in doing so? Dorie Clark: Well I think that one of the best forms of marketing of course is- it’s actually where marketing and HR ties together. Because if a company is viewed as having positive internal policies with regard to LGBT issues, that’s something that I think both for me personally and for consumers in general, tips the scales in their favor in terms of who you want to be doing business with. And it has the additional benefit of making your company more competitive from a talent perspective. So really investing in creating the kind of internal climate and policies, and then publicizing that, that we want the most talented LGBT employees. That is really valuable, and then those people can actually serve to be the best on the ground ambassadors to the world at large. Jenn T Grace: Absolutely, that is so beautifully put. Can you think of somebody kind of in the opposite direction, where a company has blatantly not supported LGBT, but yet- or internally, from an internal standpoint, but then also is trying to market externally? Have you- can you think of anybody? I’m actually trying to think of an example myself, where companies tend to have mixed messaging. So they don’t really support an internal climate, but then they want the ‘LGBT dollar’ so to speak. Dorie Clark: Yeah, yeah absolutely. You know I have not dived into this in depth in recent times, so I mean I think back years ago, I know Coors I guess has now become a ‘friend’ if I understand correctly, of the LGBT community. But I know twenty years ago for instance, there was a lot of turmoil and tumult about initiatives that they supported, and it’s my understanding at the time that internally they were actually I think not bad. But there was initiatives in the nineties that they were supporting anti-gay initiatives. All of this now has evolved over the past couple of decades, but I think there can be disjuncts at times between internal and external policies. Jenn T Grace: Yeah, I like to advise that it makes sense to be focusing on both at the same time, and make sure that your people on the inside are happy before you try to do any type of external support, even if you just want to have a Pride parade float, something that’s seemingly so- it’s a way to make a splash into the community, say ‘Hey we support the community,’ but even doing something that’s so benign in so many ways, if your internal policies don’t actually support the fact that you should be at that parade, with the way social media is, and the way that word of mouth spreads, it would come up very quickly that there was some kind of disconnect between the two. Jenn T Grace: So in terms of your brand personally and your career, one of the questions I like to ask is- and I feel like you’ve kind of hit on this a little bit even just prior to your being in the workforce, but going to college, but are there additional ways that you kind of leverage the fact that you are someone with an LGBT community in some kind of beneficial or positive way for either your business, for yourself personally, or I guess for the community at large? 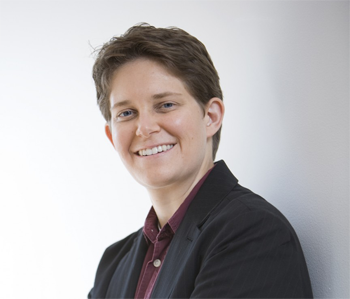 Dorie Clark: Yeah so I think certainly from a networking perspective, it’s always been a personal pleasure for me to connect with other LGBT professionals, and certainly it’s one additionally nexus of networking; so I think there’s a piece of that. I actually think that one way that I have benefitted, which is a rather unexpected way, is that in the work that I do around branding both from a corporate perspective, and personal branding, I think that in some ways my message carries more weight as I talk about it because I am- from the feedback that I’ve received, perceived as being authentic in delivering the message because I look different than most of the speakers that are out there. I’m not compromising in terms of the things that I wear or whatever. I will wear men’s suits, things like that, I’ll have short hair, and I think people realize that there may be a penalty associated with that, or at least a perceived penalty, and so the fact that I am willing to do that, because that is what I feel comfortable doing, is I think read as a testament to my walking the talk on authenticity. And so I didn’t think about that, it didn’t occur to me that that would be a factor, but that is some of the feedback that I’ve received over time. Jenn T Grace: That’s awesome. I feel like absolutely; if you’re going to be talking about authenticity on some level by sharing up as yourself and not compromising who you are regardless of the audience, that really just kind of hits the message home even further of what you’re already kind of talking about, so that’s a perfect kind of lineup. Jenn T Grace: So I want to ask you just I guess a couple more questions, and then we will part ways. In terms of just something for career advice, or business advice, is there some kind of book, or some kind of program or tool that you’re using in your business right now that’s really kind of helping you out that would be beneficial for others to know about? Dorie Clark: One thing I’ve become a real evangelist about is online calendar tools, and in fact we used one to book our session today. Scheduling things can take so many emails back and forth, it’s just a nightmare. And so it’s kind of wonderful to have this online scheduler, where you can just send people the link, they can book something directly, you don’t have to go back and forth, it’s just done. That to me is saving hours and hours every month, so I love it. There’s a variety of them, I use one called Schedule Once, but there’s many competitors in the marketplace that one can look at. Jenn T Grace: I swear by Schedule Once as well, it’s just so handy. And then when you have to reschedule you just hit the button ‘Reschedule’ and it kind of takes care of all of the back and forth hassle. So I am 100% on that train. Jenn T Grace: So what is- I guess the ending question here, and then I’ll have you kind of give a plug for all the things that you’re working on. But what is one thing in your business right now that’s working well for you, or that’s just kind of really exciting and has you all fired up about? Dorie Clark: Well I think one thing that I am really fired up about, actually just looking forward perspectively into 2016 and beyond, is that I have really made a commitment moving forward that I am going to be saying ‘no’ more often. Dorie Clark: You know, in a nice way of course, but I realize that I kind of had this revelation that the success that I’ve had here has often been because I’ve said yes to almost everything, and just tried to fit everything in. But I’ve now reached a point where just structurally it’s no longer possible. It’s just you cannot say yes to everything. And I think that sometimes there’s a little bit of a lagging realization that I’m now at a different phase in my career, I’m fortunate I’m now in a different phase where a lot more people are reaching out to me, I have a lot more opportunities, and that’s a wonderful problem to have. But I now need to start shifting so that I can prioritize things so I can triage, and so that I can carve out untrammelled time to focus on the most important things. And so that’s the decision that I’m most excited about. Jenn T Grace: I would be too, that’s awesome. Jenn T Grace: Alright, so I know that you are super busy, and I really, really appreciate your time today. I think this has been a fantastic conversation for so many reasons, and I want to make sure that it’s very and clear for folks listening to this to find out more information about you. So what would your recommendation be for them either getting in touch with you directly, checking out your books, getting on your mailing list, anything that you want to share? Dorie Clark: Thank you so much. So if folks are interested in staying in touch, and especially getting the free 42 page stand out self-assessment guide, which actually walks you step-by-step through how to develop your own breakthrough ideas and building a following around them, you can get that all for free at my website, www.DorieClark.com. I also have more than 400 free articles available on the website, so hopefully there will be a treasure trove of material for people who are wanting to dive in. Jenn T Grace: Awesome. Thank you so much, I really appreciate it. Dorie Clark: Thank you, Jenn. ← What does it take for you to tell your story? One word. Courage.